Lost 70 lbs & Reversed Diabetes! “I am not the letter writing type, but I do feel compelled to sing the praises of my dietitian, Sara Ansari. I have been working with Sara for six months now and my success has exceeded my wildest dreams! Yes, I have lost over 70 Lbs, and my waist is down to 32” from 44”, but more important is the way I feel and the progress I have made in changing my lifestyle. None of this would have been remotely possible without Sara. Her guidance and most importantly, her positive attitude are the main reasons for my success. She is available to answer all my questions with thoughtful advice and is there to pull me off the ledge when I’m struggling. She really listens to me and always has the response to put me on the right path. I find it incredibly easy to discuss any issue with her and her advice is right on point. Not only has she helped me revamp all my eating habits, but her exercise advice has been invaluable. Sara has helped my find just the right mix of cardio and weight training with some yoga mixed in to keep it fun and interesting. I know this is a program I can continue with and enjoy for a long time to come. “I first met Sara when I went with my dad to see her about losing weight and controlling his type II diabetes. My dad encouraged me to work with Sara as well, but I was very skeptical and did not think that I needed to see a dietitian. I am a young, vegan, thin, active, and look healthy. Although I didn’t look like I had any problems with food, my diet and eating habits were not balanced and my love of candy was leaving me feeling out of control. I had seen dietitians in the past that did not seem to really “get me” and were not able to help. After a few weeks of my dad meeting with Sara, I saw a big change in him and noticed that he was starting to lose weight (he ended up losing 50 lbs over 6 months! His blood sugar is now normal and was able to get off the diabetes medication). I decided to make an appointment with Sara. She made me feel comfortable about opening up about any issues or concerns I had. She explained to me the importance of getting more vegan sources of protein in my diet (which I was always scared of) and helped me learn to manage my sugar cravings. She taught me about how to eat a balanced diet and food combinations. She worked with me weekly to help me overcome my food fears and body image issues. Not only is she a great dietitian, but she was my counselor and became my friend. I had the pleasure of working with Sara on a weekly basis over a period of 3 months. With her guidance and support, I was able to lose 30lbs during that time. Prior to working with her, I had been trying to lose weight on my own for 2 years without any significant weight loss. 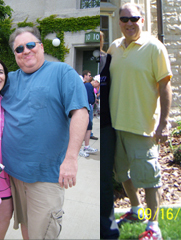 I was bicycling up to 100 miles per week and going to the gym about 3 times per week, but my weight stayed the same. Sara was able to teach me that my main obstacle was diet related. She helped me understand that I could exercise all I wanted, but in order to lose weight, I needed to make changes in my eating habits. She counseled me on what to eat and how much, as well as what to avoid. She not only taught me about good nutrition, but helped me improve my habits and overcome struggles along the way. Sara is very knowledgeable and will listen without judgment. She took the time to personally assess what my diet needs were on a weekly basis and helped me set weekly goals. She motivated and challenged me and I finally got results. I was losing about 2-3 pounds every week while maintaining a healthy diet and exercise routine. I highly recommend Sara as a diet consultant–she certainly helped me out!